The raison d'être of this blog is to review quality books, music, photography and other content that is seldom brought to our attention by the mainstream media. The title EV+1 is photographic jargon for Exposure Value plus 1: increasing exposure by one stop from the metered value. Photographers use exposure compensation in order to obtain a correct exposure, when the light meter's averaged reading would be incorrect. Like a photographer allowing an extra stop of light to reach the film, I hope to shed a little light on a few under-appreciated gems. I should preface this review with the embarrassing confession that I know more about the New York jazz scene than that of my own country. However, this prompts the comment that fans of accomplished guitar ensembles on the New York scene, such those of as Adam Rodgers, Gilad Hekselman or Steve Cardenas, will find a lot to admire about this trio. Recorded in 2008, Open to Suggestions was the band's first release. Insightfully supported by the superb rhythm section of Ron Samsom on drums and Kevin Haines on bass, Dixon Nacey's improvisations weave logical paths around a repertoire consisting half of standards, the other half being compositions by the band members or other contemporary jazz musicians. It is perhaps apt that the album opens with the tune All or Nothing At All, for Nacey gives his all - and delivers. Opening with broken chords* from an archtop guitar in the slightly muted tone usually favoured by jazz players, what unfolds is an ebullient solo: having stated the tune, he embarks on an expansive, mostly single-line improvisation (interspersed with block chords), in which he examines the tune's possibilities with a propulsive coherence, building in intensity with each chorus. Underpinning Nacey's playing is a meticulous and empathetic rhythm section; Haines's bass solo, which follows Nacey's, is possessed of the same intuition, vigour and precise rhythmic drive with which he supports the guitarist. Another track that I'd like to single out for special comment is the gem of a title track, Open to Suggestions, composed by Ron Samsom; I don't think it's extravagant to describe it as a masterpiece of succinctness. Anyone with enough training can write a clever tune, but it takes native talent to write one that is haunting; Open to Suggestions is such a tune. The head and subsequent improvisations are logical developments springing from the four notes of the opening motif (flat 5th/5th/min 3rd/tonic), which follows a chordal introduction. Samsom's composition, followed by the solos from Nacey and Haines, is a mesmerising conversation between guitar, bass and drums. Jim Hall famously had (or maybe still has) a notice inside his guitar case that said 'Make musical sense.' What else matters? This album's performances make sense, take the listener through a sampling of the tunes' possible twists and turns and resolve those journeys. Common denominators throughout are a deep empathy between the musicians, a very tight rhythm section (although Samsom is inclined to be slightly reserved), inspired improvisation from both Nacey and Haines and sublime recording quality. If I am to be picky, there is just one track that bugged me: called Off Topic, it is an elegant 35 second fragment, begging to go somewhere. I don't know why these vignettes sometimes appear on otherwise superb albums. Mike Stern did a similar thing by including a short piece called Source on his classic album Standards (and other songs); in my opinion, it didn't fit in with the rest of that album's content and I'm a bit puzzled by the inclusion of Off Topic, here. Potentially possessing the same sort of beauty as the Evans/Davis composition Blue in Green, I hope it pops up again in a future album, fully realised. These musicians have paid their dues with no compromise attitudes to excellence in studying and performing music. This album is the product of a desire to make music for the sake of making music; and years later, I believe it will be looked upon as a New Zealand jazz classic. 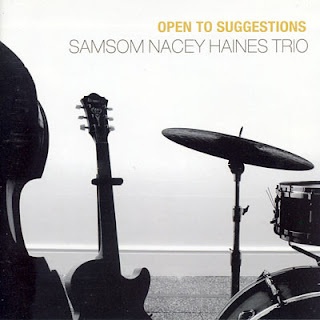 If, like the Samsom Nacey Haines Trio, you care about jazz or about New Zealand music, buy this album; it will reward you. The CD is available online at Amplifier. Dixon Nacey has a jazz guitar tuition site called Jazz Guitar Legend. Reid's Reader – A Blog of Book Reviews and Comment. Copyright © Richard Smallfield 2011. Simple theme. Powered by Blogger.